In Flanders, you cannot break through anything. Jef Cornelis: …I had taught much earlier than that. In the 1960s, I gave a course at the Herman Teirlinck Studio in Antwerp. Fons Goris, who was director at the time, had hired me to teach their students how to use the camera and microphone. K.B./D.P. : Did you teach at the Teirlinck Studio for long? J.C.: Five years, until 1968, I think. K.B./D.P. : How did you handle the classes? J.C.: My approach was definitely brazen. So, what was their first task? Go to the photo machine at the Central Train Station and come back with a photograph of yourself. I also required all the students to dress and undress in front of the camera. Anyone who had trouble with that was not suited for this profession. I took the students to the VRT (Flemish Radio and Television) studios and two private studios where I worked. We did tests: How do you present yourself in front of the camera? How does your voice work? I mostly gave practical classes. K.B./D.P. : Why did you leave the Teirlinck Studio in 1968? J.C.: It wasn't the students I got fed up with, but the institute. I always sat up on the roof with the students — if it wasn't raining — to get some air, away from those horrible classrooms. Some of my colleagues at the time also did wretched things — students were thrown out of classes. That is just unimaginable! You only do things like that with little boys, not with young adults who want to become actors or actresses. K.B./D.P. : How did your appointment to Sint-Lukas College in Brussels come about? Why did you want to go back into art education? J.C.: Chris Dercon convinced me. He had started a video studio at Sint-Lukas and asked me to give the students some insights into the production of audiovisual works. Chris was adored by his students. He was also very generous with them. How many minds has he nurtured over time?! K.B./D.P. : How did you get to know Chris Dercon? J.C.: I met him at the VRT's Department of Art Affairs. Stefaan Decostere had made a number of television films together with Chris, including Er ligt een videocassette in de soep [There Is a Videocassette in the Soup] (1983), Nam June Paik (1984), Dans + Camera [Dance + Camera] (1985) and Warum wir Männer die Technik so lieben [Why We Men like Technology so Much] (1985). So I saw Chris regularly. It was written in the stars that we should work together. One nice detail is that Chris is a nephew of Cas Goossens, then General Manager of the VRT. K.B./D.P. : Did the public broadcasting company (VRT) immediately agree to your teaching at Sint-Lukas? J.C.: Yes, as long as I made up the hours that I spent at Sint-Lukas. That was the agreement. K.B./D.P. : Why did you actually decide to accept Dercon's invitation to teach at Sint-Lukas? J.C.: I have said a number of times that I did not grow old with my own generation. K.B./D.P. : You were interested in young people? J.C.: Yes, I have always been curious about the thinking and the productions of people younger than myself. At Sint-Lukas, I was able to become acquainted with very talented artists, including Ana Torfs, Franciska Lambrechts and Gert Verhoeven. Franciska always had good, interesting ideas. She was an inspiration to everyone. But there were also a lot of uninteresting students walking around, and the interest in my profession was very limited. The result showed as much: most of the students could not produce. Production is for me something completely different from art. Production is the same thing as organizing. It has an almost military aspect to it. I find that interesting. K.B./D.P. : Were there ever plans to work together with any of the more promising students? J.C.: No, but that certainly would not have been something that I would by definition have been opposed to. K.B./D.P. : Can you tell something about your educational approach? J.C.: I took the students with me to the VRT and visited the various departments. I got along well with the people who ran the technical services – those who made the decisions about the facilities and equipment that would be used. If you wanted to achieve something in public broadcasting, it was essential to get along well with the technical people. I didn't need the General Manager for that. On the other hand, he could certainly take those facilities away from you. K.B./D.P. : Did you take your own production files along with you to show them to the students? J.C.: Yes, but they were of course busy making their own little films. They were not interested in the material I was teaching. They could not produce. They knew nothing about it. It was only after they graduated that I kept getting telephone calls asking me to help them further. K.B./D.P. : Did you also see the work of the students? J.C.: Of course. I asked them to show their videos, asked what the best things were that they had done so far, and gave them my comments. K.B./D.P. : If you felt that the work wasn't good, did you say that to them? J.C.: Yes, very clearly. There could be no doubt whatsoever about it. In teaching art, you have to be rock-hard, right from the beginning. If they then want to come back again, something can grow out of it. Those who stayed away did not have that sacred flame in them that would make them artists. K.B./D.P. : That sounds pretty merciless, Jef. J.C.: It may be, but I have always been very annoyed by the hundreds of people who attend art schools and make really bad art. K.B./D.P. 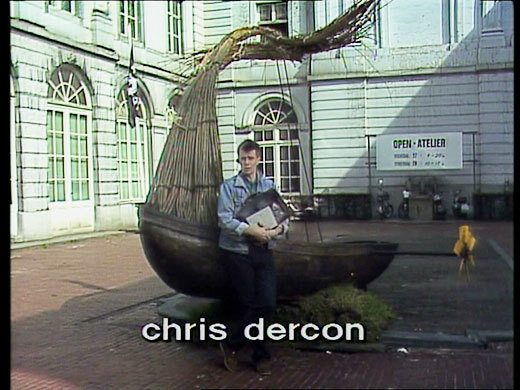 : Chris Dercon left for New York in 1988, where he became curator for PS 1. Who replaced him at Sint-Lukas when he went to New York? J.C.: I don't remember. Chris left and I stayed. K.B./D.P. : After he left, did you build up contacts with the other teachers? J.C.: Hardly, or not at all, because I only taught one class, no more than 30 hours per school year. I got along well with Paul Lerno, who was then director of Sint-Lukas. He occasionally asked my advice. For example, I suggested hiring the computer artist Peter Beyls as a teacher. I had gotten to know Beyls when we did the IJsbreker broadcast on computer art in 1984. K.B./D.P. : How did the idea develop for making the film, 3 x kunstonderwijs [3 x Art Education]? J.C.: I believe that I had brainstormed about it a number of times with Chris, certainly in the time when we were colleagues at Sint-Lukas. Our experiences at the school certainly played a role, but so did contacts with such artists as John Baldessari, Daniel Buren and Dan Graham. They were always involved in teaching art and had extremely outspoken opinions about it. K.B./D.P. : In the mid-1980s, what circumstances brought you into contact with Buren, Baldessari and Graham? 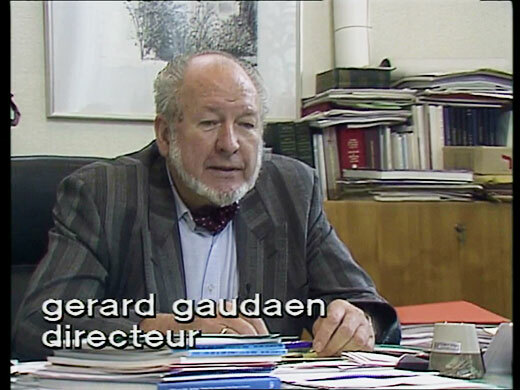 J.C.: After the completion of De langste dag [The Longest Day], the live broadcast that I made for the 1986 Ghent Art Summer, I got into a discussion with Gerard Mortier, director of De Munt/La Monnaie, with an eye to a project with contemporary visual artists in opera. John Baldessari, Daniel Buren and Dan Graham were involved, along with countless other artists. I remember that they would sometimes speak about their experiences at various educational institutes. After a while, the opera project was abandoned, apparently because there wasn't enough money, which frustrated me enormously. It was at that point that I asked Chris if he would like to work on a film about education in art. I have to immediately add that I would never have dared to make the film if I had not had access to the people and the equipment I had asked for. K.B./D.P. : What do you mean? J.C.: I wanted to use an outdoor broadcasting vehicle, which was normally only used for reporting sports events. For that reason, the film was made on video and not on film. In addition, it was important to me to work with at least three cameramen and as many sound technicians. Those were the essential conditions. Without those people and facilities, I could never have made the film. J.C.: There are complex situations in the film — teachers, students, works of art in different classrooms at three different art schools. In situations like that, you would be hopelessly lost with just a single camera. When I got the go-ahead from the technical department of the VRT, I knew I could bring the project to a good result. I had the film truck at my disposal and the people who worked on it, 14 in all, virtually all of whom I knew well. During that same year, by the way, I went with them to Münster (Germany), to shoot a film about Skulptur Projekte 1987, with Chris again involved. K.B./D.P. : You had worked previously with many of the technical staff on the live discussion program, IJsbreker [Icebreaker] (1983-1984). J.C.: That is true, but not with all of them. It may sound odd, but I really mean it from the depths of my heart: I got along really well with those technicians. My assistant, Eva Binnemans, played an important role in that. She had outstanding relationships with all of those technical people, and that understanding was not without significance. If something went wrong during the filming, they resolved it then and there. Those are the kind of people you need. K.B./D.P. : 3 x kunstonderwijs was one of the first projects that you worked on together with Eva Binnemans. 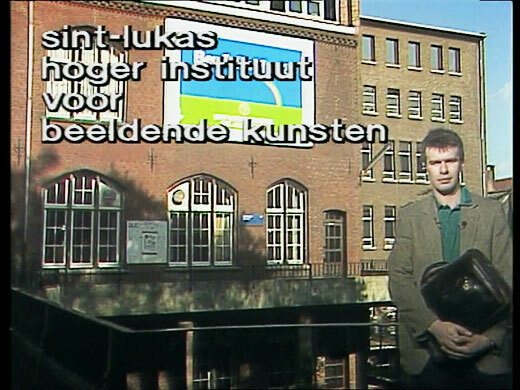 J.C.: The first film we did together was Beeldende kunst in België [Visual Art in Belgium], a discussion program with all the important figures from the Belgian art world, which was aired in 1986, just before De langste dag. Eva was the ideal assistant. She was not particularly fast, but she was efficient, on time and tenacious. She also got along very well with Hilda Verboven, who was Head of the Arts Department. All the films I completed after 1987 were done with Eva at my side. K.B./D.P. : 3 x kunstonderwijs, as the title laconically implies, centres on three schools for higher art education: 1) the Royal Academy of Fine Arts in Ghent, 2) the Royal Academy of Fine Arts in Antwerp and the National Higher Institute for Fine Arts (then still located at the site of the Royal Academy in Antwerp), 3) the Sint-Lukas College in Brussels. At that time, there were five other art academies in Flanders. Why did you specifically choose those three – or four – institutes? J.C.: Selecting those institutes was self-evident. They were located in the three largest cities and each had a different power base. The Academy in Ghent was the city school, the Royal Academy in Antwerp and the National Higher Institute for Fine Arts were the Flemish institutes, and Sint-Lukas was Catholic. In Ghent, it was the city fathers who ruled, in Brussels the Catholics, and in Antwerp a mix of the two. Those three different cornerstones were the equivalent of three different ‘atmospheres’. It was a distinction that was very important to me. K.B./D.P. : Had you visited the other five art schools? J.C.: Yes, of course. I went everywhere, with the exception of the Provincial Higher Institute for Art Education in Hasselt. I did the research for the film entirely on my own. The broadcast required a long preparation period. I visited seven institutes, made the definitive selection and got permission from their directors to film there. K.B./D.P. : Was it tactful to include Sint-Lukas in Brussels in the project? You and Chris Dercon were on their payroll. J.C.: I paid no attention to any of that. A week after the broadcast, I was happily back teaching at Sint-Lukas. Why not? We gave the school no special treatment whatsoever. For Chris and myself, it was an educational institute like any other, one that we approached equally critically. We also paid no attention at all to the video studio. The only departments covered in the film were sculpture and painting. K.B./D.P. : Why did you choose just sculpture and painting? J.C.: That gave us more than enough material, believe me. We had to restrict ourselves, or it would have become a jumble no one could untangle. K.B./D.P. : It is understandable that you made that choice, but it was not explained or introduced. It was not even mentioned that the schools had other departments, including applied arts. J.C.: That is perhaps a valid criticism. K.B./D.P. : In 3 x kunstonderwijs, it is the Royal Academy of Fine Arts in Ghent that is first portrayed. Why did you begin the film in Ghent? J.C.: You won't find any special reason for that. The order that the schools appear in the film is the same as the order in which they were filmed. We spent three days at each. From the 1st to the 3rd of June 1987, we were camped out at Ghent. K.B./D.P. : Each portrait begins in a virtually identical way: Chris Dercon steps into the building, provides a short introduction, seeks out one of the secretaries, asks some questions, and is then led to the director's office. J.C.: I felt that we needed to have a picture of the buildings in which the schools were housed. It seemed best to me to just start with a secretary. Chris, in fact, had no idea where he was going to be. I had done some reconnaissance and only instructed him about the plan on the first day we filmed. The fact that he was willing to do that — just go up to a desk and start talking with someone on the secretarial staff — was fantastic. K.B./D.P. : There is also something embarrassing about it, because the secretary — in Ghent, it was Philippe Van Wemmel — was rather forced to act his part. J.C.: That was not a problem, I felt. In Antwerp, that situation was much more awkward. K.B./D.P. : In the filming schedule that we found in your archives, it is mentioned that there were rehearsals before the shoots. J.C.: 'Rehearsal' is an unfortunate word. There were no rehearsals. It was more an assessment of the situation, for Chris and the technicians as well as for those we interviewed. I explained to everyone what we were planning to do, and then we began filming. K.B./D.P. : Philippe Van Wemmel escorts Chris Dercon to the office of Pierre Vlerick, the director of the Ghent Academy. In the VRT archives, we found a complete transcript of the dialogue between Dercon and Vlerick — and the two other school directors. 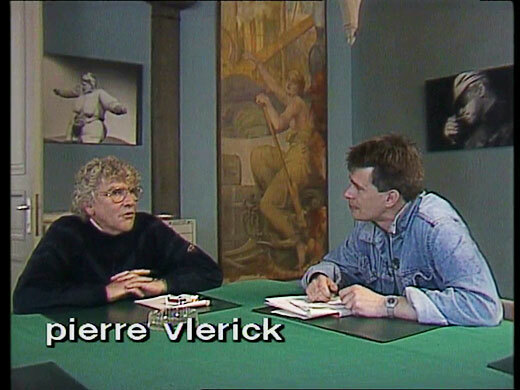 In the film, only a minimal excerpt from the interview remains, while Vlerick is allowed to present himself as ‘animator’. J.C.: I had an unbelievably huge amount of material. I was working with three cameramen, each of whom was soaking up images for three whole days at each location. The cameramen did superb work. There are some very good frames in the film and some of the sequences are exceptionally long. The selection after the fact was brutally difficult. K.B./D.P. : Three schools, three days each, with three cameras: the number three seems to be a consistent theme in this film. At the academies, moreover, there are three invited artists, three art theorists, three curators and three art dealers, one at each school. In Ghent, they were Panamarenko, artist; Lieven De Cauter, art theorist; Jan Debbaut, curator; and Joost Declercq, gallerist. Who brought those groups together? J.C.: I did. All those invited were also properly paid, at 4,000 Belgian francs [100 €] each. K.B./D.P. : Why did you select them? For example, why Panamarenko? J.C.: Panamarenko had been fiercely outspoken in the first episode of IJsbreker. I knew he believed in what he said. K.B./D.P. : You could have asked Panamarenko for Antwerp as well. J.C.: No, there I want to call on someone else. K.B./D.P. : Amongst your invited guests were also the teachers from the various studio departments at the school — Karel Dierickx, Nadine Van Lierde, Jean Bilquin, Marc Maet, Geert Vercaemer and Noël De Buck — as well as their students. Had you spoken with them in advance? J.C.: Barely. During the ‘introduction’, we discussed what was in the program and then immediately started filming. K.B./D.P. : It is striking that most of the teachers do not speak. At a certain point, Jean Bilquin and Nadine Van Lierde sit there as if they had been smitten by the hand of God. They stare down at the floor. We never find out what they think about art or art education. When Panamarenko is speaking, Karel Dierickx is supposedly there — or at least that is what the recording schedule says — but we don't even see him. J.C.: It is possible that Bilquin, Van Lierde and Dierickx did have something to say, but it never made the final version. That is a possibility. J.C.: Joost definitely dived in. J.C.: …of course! He worked in Ghent, first as coordinator of Het Gewad, and later as a gallery owner. It was important to hit the nail on the head. I was pleased that he stuck his neck out. K.B./D.P. : In the recording schedule, it says that a final contact with the director was planned for the third day. J.C.: That never happened, because Vlerick had ridden off into the sunset. There was a final conversation with Wim Van Mulders, some of his colleagues and their students. We saw that last conversation, to which we invited the teachers of philosophy of art, art history and contemporary art, as a moment of reflection about training in art itself. K.B./D.P. : The section about the Royal Academy of Fine Arts and the National Higher Institute for Fine Arts in Antwerp also begins with a brief introduction by Chris Dercon. Then there is a short conversation with the secretary, Esther Winkelmans. The tone is immediately set with Dercon's first question: ‘Are there still people who want to come paint and make sculpture?’ When Winkelmans mentions the number of people taking the entrance exams, Dercon concludes, ‘So you can say that painting and sculpture are not at all popular at this moment?' It sounds really denigrating. J.C.: I think that somebody from the Royal Academy of Fine Arts of Ghent had telephoned to Antwerp. Or had the people at Antwerp gotten in touch with Ghent themselves? K.B./D.P. : Are you suggesting that there was communication between the academies before your arrival in Antwerp on 4 June 1987? J.C.: I suspect that was the case, and for that reason, they were very cautious in Antwerp. K.B./D.P. : That shouldn't surprise anyone, if you look at how condescending Dercon's questions were. J.C.: I recall that the reception in Antwerp was significantly cooler than it had been in Ghent. Gerard Gaudaen, the director of the Royal Academy, was clearly on his guard. K.B./D.P. : Gerard Gaudaen had to fend off several very critical questions: ‘Are you saying that the Royal Academy (…) has to be a laboratory where everything is possible? Or are you not saying that?’ And a little later, he has to swallow the following comment — which also did not make the final cut, but is in the transcript: ‘So experimentation is in fact virtually pushed out of the way, or is at least put on the back burner…’ The director was put on the defensive. J.C.: It is clear that we were sceptical about the ideas about education at the Royal Academy. We could not just set that aside. K.B./D.P. : While Gaudaen is holding court about ‘art and creativity and knowledge about the profession’, Chris Dercon rudely leans back and lights a cigarette. J.C.: Yes, that is true. It definitely became uncomfortable. K.B./D.P. : At the end of the scene, we see Chris Dercon touching his ear. We had already noticed that he was wearing earphones. Were you in contact with him? J.C.: Not only with him, but with all of the cameramen and sound technicians. I was in the film truck, together with Eva Binnemans, giving instructions to my colleagues. K.B./D.P. : So you were not on the set!? J.C.: No. During the ‘introduction’, I talked to everyone involved and explained what was going to happen. Then I went back to the film truck and organized everything from there. K.B./D.P. : So you were nowhere in sight and you still directed the entire team? J.C.: Of course! I knew all the protagonists; the camera and sound people didn't know any of them. I guided the technicians directly: ‘On the left is Benoit Angelet! Stay where you are.’ I could make the film I wanted to make without showing myself. K.B./D.P. : Did Gaudaen know that you were able to make a film in that way? J.C.: No, none of the school directors had any insight. The film truck was my secret weapon. K.B./D.P. : And did Gerard Gaudaen know the names of the guests: Benoit Angelet, art theorist; Guillaume Bijl, artist; and Adriaan Raemdonck, gallerist, whom you had invited at the Royal Academy, and Jan Hoet, curator, who visited the National Higher Institute? J.C.: Like all of his colleagues, Gaudaen had received the filming schedule, but I have no idea if he had read it or not. In any case, no one asked me any questions about it. K.B./D.P. : The most poignant scene at the Royal Academy is undoubtedly in the sculpture studio, which was run by Wilfried Pas and Guy Maclot. Guillaume Bijl storms in with a cola bottle. J.C.: It is the most beautiful moment in the film. Guillaume was brilliant: ‘Isn't there too little space here? Can you bring your own materials, like a hothouse?' — all in his thick dialect. I had already known Guillaume Bijl for some time. I respected him because he always supported young artists. K.B./D.P. : Did you know in advance which students would be present? J.C.: No, that would have been impossible. In Antwerp alone, we visited no fewer than three group studios. At the National Higher Institute, I did visit all of the individual studios, at least those where the students allowed me in. Some shut their doors when they heard I was coming and others let me know that they did not want to work with us. K.B./D.P. : At the National Higher Institute, Jan Hoet was the main protagonist. He did exactly the opposite of what all the other guests did: instead of taking a critical approach to the work of a young artist, in this case Lene Keunen, he praises it to the skies. Hugo Heyrman, a professor of painting at the National Higher Institute, cannot believe his ears. J.C.: I was just as surprised that he thought the work was good. K.B./D.P. : What he has to say about the work is completely unbelievable. He seems to have assumed that anything he would say would just be taken like syrup, on face value. J.C.: Yes, that describes him perfectly. K.B./D.P. : Whereas in Ghent, at the end of the visit, there had been an informal get-together, the students in Antwerp are seated perfectly, one behind the other, like a little class. The setting is completely different. Was that a commentary on the hierarchical system at the academy in Antwerp? J.C.: If that was so, then it was completely unconscious, but it certainly reinforces the fact that relationships in Antwerp were indeed very hierarchical in nature. K.B./D.P. : The section about Antwerp ends poignantly, with the words ‘pure indoctrination’ spoken by a student. You could hardly think of a harsher verdict. J.C.: No one can deny that. J.C.: ‘How can I become Da Vinci?’ That was the slogan at Sint-Lukas. That was a sharp bit of marketing, if you ask me. J.C.: Chris and I had a very strong impression that what Sint-Lukas was primarily all about was image-building and marketing. If you heard what the teachers, such as René Hertecant and Koenraad Tinel, had to say about their teaching and examination techniques, you knew all you needed to know: Sint-Lukas was in fact not a whisker better than the other two schools. K.B./D.P. : At Sint-Lukas, your guests were Anny De Decker, former gallerist; Wilfried Huet, director of the Municipal Academy of Fine Arts at Waasmunster; Willy Van Sompel, artist; and Bart Verschaffel, art theorist. One very striking scene is when Bart Verschaffel is talking with some of the students, in an informal atmosphere. We only notice later that Fik Van Gestel, one of the Sint-Lukas teachers, is sitting there as well. You almost have the feeling that he is one of the students, simply because he just sat down with them. J.C.: It was clear that at Sint-Lukas, things were far less hierarchical than they were at the Royal Academy in Antwerp. For the rest, the accent at Sint-Lukas was the same as Antwerp — the college was focused on technique. The development of ideas, the reflection on art and being an artist had no priority. K.B./D.P. : Why had you invited Wilfried Huet? J.C.: In 1984, Huet had participated in the 13th episode of IJsbreker, entitled Er gebeurt iets in mijn dorp [Something Is Happening in My Village]. He was the driving force behind the Gallery of the Waasmunster Art Academy (GA). What he had managed to achieve in that village was absolutely impressive. I had an awful lot of sympathy for him and for the work he was doing. K.B./D.P. : Why doesn't he have anything to say in the film? J.C.: Either he didn't actually say anything, or I did not select any fragments with him speaking. I don't remember. I had an unbelievable amount of material, with three cameras and an enormous number of hours of film. The point was to keep only the most expressive and significant excerpts and hammer them into a single whole. K.B./D.P. : he fact that Narcisse Tordoir, a teacher at Sint-Lukas, says that he is leaving, going to the Rijksacademie in Amsterdam and ‘getting out of this land of apes’, was significant to you, for example. J.C.: I intentionally recorded that. There is no doubt about it. K.B./D.P. : Another example of a polemical comment was by Lieven Delafortrie, of the experimental studio at Sint-Lukas: ‘We are governed by people obsessed by commas, in a way that cannot be followed… It is all that increasing bureaucracy.’ Had you also intentionally put that in the film? J.C.: Yes. But don't ask me what I took out, because I won't remember. K.B./D.P. : Given the fragments that did make it into your film, the conclusion would have to be that you were very sceptical about art education in Flanders. J.C.: Sceptical? I have been fighting against it my entire life! K.B./D.P. : How do you think one should conceive of education in art? J.C.: I was of the opinion that for Flanders, a single art academy would be more than enough. I have always been convinced of that. It makes no sense to graduate hundreds of painters and sculptors every year. K.B./D.P. : In your own archives and in the archives of the VRT, we came across interesting documents about the reception of 3 x kunstonderwijs. On 16 June 1987, only four days after the last recording session in Brussels, you received, at your home address, a letter from Paul Lerno, director of Sint-Lukas College. He wrote, ‘I have just received a number of teachers from different departments. They expressed the desire that I request that you do not sow confusion, and not identify the Academy with just one or two of its studios. The diversity of the studios, each clearly inspired by a different professor in charge, is extremely broad. This diversity is therefore also our great wealth.’ It is clear that the shooting of the film had generated the requisite agitation. Lerno also sent a copy to Chris Dercon, which was a serious matter, because at that time, Dercon was earning his living there. J.C.: It did stir up some commotion there. It's the best evidence that we did not approach Sint-Lukas any differently than the other schools. But Paul Lerno never blamed me for anything in connection with the film. If I recall correctly, I even had a conversation with him about it. K.B./D.P. : The film also touched a nerve elsewhere, again, even before it was edited. 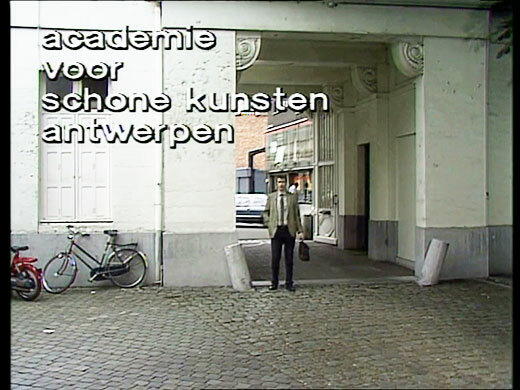 On 13 July 1987, Jan De Groof, the Head of the Private Office of Theo Kelchtermans, the Minister of Education for Flanders, wrote a letter to Cas Goossens, General Manager of the VRT, in which he wrote, ‘By way of persons in art education who participated in this program, fear is being expressed that the program will be tendentious and negative, and as such would damage the reputation of our higher education in the arts. Given the level of art education [in Flanders], that would be very unjust. May I request that you remain alert, in order that here too, objectivity be maintained.’ Which ‘persons in art education’ would it have been who had approached De Groof, in order for him to actually write a letter about a film that didn't even exist yet? J.C.: I cannot say for certain, but I think it must have been the people from Antwerp, Gerard Gaudaen's circles. They had smelled a rat, that much was certain. K.B./D.P. : It is very interesting to see how that letter was handled at the public broadcasting service. First, Bert Hermans, General Director of Television, was informed. He passed the information on to Jan Van der Straeten, Head of the Section of Culture, who in turn informed Hilda Verboven, Head of the Department of Art Affairs. J.C.: Bert Hermans will have tipped off Hilda Verboven himself. K.B./D.P. : Ultimately, Claude Blondeel, the producer of 3 x kunstonderwijs, composed a memorandum in which he summed up arguments defending the film. Then that memorandum followed a circuitous route, ultimately with Cas Goossens writing a reply to the Head of the Private Office of Minister Theo Kelchtermans. J.C.: That is the way a bureaucracy should work. J.C.: I had forgotten that I was prepared to take it to such lengths. That proposal obviously never made it out of the box. J.C.: Was he trying to safeguard himself? However that may be, the VRT management made no use of it. K.B./D.P. : The VRT management did not watch the program in advance, although they had the opportunity? J.C.: No. The institutional weaknesses gave me opportunities. It's as simple as that. K.B./D.P. : You were in any case under pressure. Did those letters from Lerno and De Groof lead to any form of self-censure whatsoever? J.C.: They never lowered my resolve. K.B./D.P. : The film still had to be edited. You were able to choose what fragments you left in or took out? J.C.: I made the film I intended to make. K.B./D.P. : After the film was broadcast on 26 August 1987, hell really broke loose. The first to address a letter to Cas Goossens were directors of limited curriculum art education programmes. That is in itself very strange, because the type of education they were responsible for was not even mentioned in the film. Soon thereafter, there were letters from Albert Tersago, an inspector for the Ministry of Education, and René Smits, an honorary federal inspector for art education. Both of those letters were written on the same day, 7 September 1987. J.C.: It was clearly a coordinated response. J.C.: I had forgotten about that. I had forgotten that it became so vehement. K.B./D.P. : What might those ‘intrusive measures’ have been? J.C.: What do you think? Admitting culpability; an immediate job dismissal? J.C.: It happened all the time. You just had to learn to live with it. Everyone who stuck their necks out in public broadcasting took the full weight of it at some point or other. K.B./D.P. : From the internal correspondence that once again followed its course along the different stopping points up the hierarchy, it seems that everyone in management stood as one behind you. Verboven, Hermans and Goossens all agreed with Blondeel's argument that ‘The approach of the program [was] perhaps hard, but it assessed the value of education in art in a pertinent manner. The notion that the makers of the program were "out to get" art education is a subjective interpretation.’ How would you explain that solidarity? J.C.: Hilda Verboven was my great strength and support, and she in turn had the protection of Bert Hermans, General Director of Television. It probably also did no harm that Chris was a nephew of Cas Goossens. K.B./D.P. : The only one who did not seem satisfied with the responding letter from Cas Goossens was Jan De Groof. On 30 November 1987, he again entered the ring. In a third letter to Goossens, he wrote, ‘The objections that had been expressed by us — and by many others along with us — concern neither the choice of the schools nor the voluntary participation of professors and students, but primarily the manner of interviewing and the selection that was made from those interviews. This led not so much to a "perhaps hard approach", but was first and foremost distorted, which was further reinforced by the one-sidedness of the commentators from the arts sector.’ He was in fact the only one who had really watched the film. What might those ‘intrusive measures’ have been? J.C.: Yes, you can say that after the fact, but he — in my opinion — also had his own interests in mind. J.C.: Nothing of that took hold. The whole affair just fizzled out. K.B./D.P. : Was there anything at all in that history that had any effect? J.C.: No. In Flanders, sooner or later, everything burns itself out. You can say the same thing about the impact of the film. Did the film make any lasting contribution at all? No! In Flanders, you cannot break through anything. Everything just gets worn down.